GENEVA - Two research teams hunting for an elusive subatomic particle believed to be a basic building block of the universe say their latest data help narrow the search. Guido Tonelli, lead physicist for the team running the so-called CMS experiment, outlined findings similar to those of the first team unveiled earlier Tuesday in Geneva. Both show the Higgs boson can be found "in the low mass region" of the massive atom smasher being used to track it down. The unveiling of the latest data has generated much buzz among researchers who hope that the particle, if it exists, can help explain many mysteries of the universe. British physicist Peter Higgs and others theorized the particle's existence more than 40 years ago to explain why atoms, and everything else in the universe, have weight. The Higgs boson - also known as the so-called "God particle" - is more likely to be found in the lower energy ranges of the massive atom smasher being used to track it down, the team's leader said. The information is expected to be confirmed later in the day by the second team. Both of the research teams are involved with CERN, the European Organization for Nuclear Research near Geneva. CERN oversees the $10-billion Large Hadron Collider under the Swiss-French border, a 17-mile (27-kilometer) tunnel where high energy beams of protons are sent crashing into each other at incredible speeds. Fabiola Gianotti, the scientist in charge of the ATLAS experiment at the Large Hadron Collider, said the signal was centered at around 126 GeV (Giga electron volts). Several mass or energy ranges within the atom smasher are now excluded to a "95 percent confidence level," Gianotti told physicists at CERN. "I think it would be extremely kind of the Higgs boson to be here," she told a seminar to discuss the findings. "But it is too early" for final conclusions, she said. " More studies and more data are needed. The next few months will be very exciting...I don't know what the conclusions will be." The Higgs boson is, in theory, the particle that gives mass to all other fundamental particles. 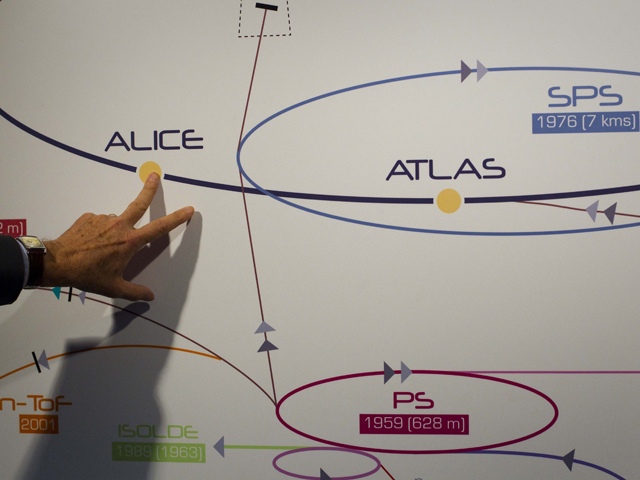 While its discovery would cement current knowledge about particles such as electrons and photons, results of work at CERN could also prove it does not exist, which would force physicists to rethink the Standard Model. Researchers believe data about the so-called Higgs boson could help explain many scientific mysteries. British physicist Peter Higgs theorized its existence more than 40 years ago to explain why atoms have weight. Although it would be an enormous scientific breakthrough for the physics world if the Higgs boson was found, officials at CERN have ruled out making any such announcement this year. Rolf Heuer, director of the European particle physics laboratory near Geneva, said in conclusion that "the window for the Higgs mass gets smaller and smaller." "But be careful - it's intriguing hints," he said. "We have not found it yet, we have not excluded it yet."